“No man is an island….” So wrote the poet John Donne four centuries ago. And while he meant the unity of humanity, the metaphor could equally apply to the interdependence of the various parts of the human body, including the mouth. According to recent scientific research, your mouth isn’t an “island” either. Much of this research has focused on periodontal (gum) disease, an infection most often caused by bacterial plaque that triggers inflammation in the gum tissues. Although an important part of the body’s defenses, if the inflammation becomes chronic it can damage the gums and weaken their attachment to the teeth. Supporting bone may also deteriorate leading eventually to tooth loss. Avoiding that outcome is good reason alone for treating and controlling gum disease. But there’s another reason—the possible effect the infection may have on the rest of the body, especially if you have one or more systemic health issues. It may be possible for bacteria to enter the bloodstream through the diseased gum tissues to affect other parts of the body or possibly make other inflammatory conditions worse. One such condition is diabetes, a disease which affects nearly one person in ten. Normally the hormone insulin helps turn dietary sugars into energy for the body’s cells. But with diabetes either the body doesn’t produce enough insulin or the available insulin can’t metabolize sugar effectively. The disease can cause or complicate many other serious health situations. 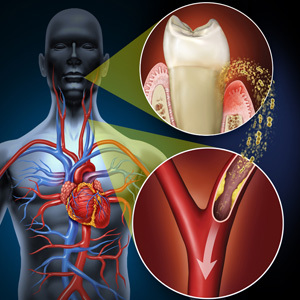 There appears to be some links between diabetes and gum disease, including that they both fuel chronic inflammation. This may explain why diabetics with uncontrolled gum disease also often have poor blood sugar levels. Conversely, diabetics often have an exaggerated inflammatory response to gum disease bacteria compared to someone without diabetes. The good news, though, is that bringing systemic diseases like diabetes under control may have a positive effect on the treatment of gum disease. It may also mean that properly treating gum disease could also help you manage not only diabetes, but also other conditions like cardiovascular disease, osteoporosis, or rheumatoid arthritis. Taking care of your teeth and gums may not only bring greater health to your mouth, but to the rest of your body as well.